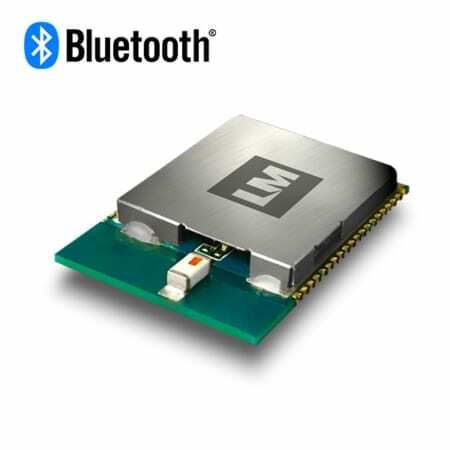 LM747 is LM Technologies Bluetooth® (5 compliant), v4.1, v4.0, v2.1 Dual Mode Class 2 Multimedia module with stereo flash. This module is ideal for multimedia applications in vehicle infotainment systems, handsfree kits, headsets, Bluetooth speakers and Bluetooth® Stereo Headsets and much more. The LM747 Bluetooth® 5 compliant audio module is a compact and cost effective solution. Enabling audio data to be wirelessly communicated between audio devices. Using a Bluetooth® v2.0, v2.1 and Bluetooth® v4.0, v4.1, (or 5 compliant) connection. It’s sound enhancement features, makes it a perfect fit within your premium audio device. Perfectly suited to wireless headphones, speakers and hand-free headsets. This standalone module allows the developer to connect a microphone, speakers and other I/O devices. LM offers firmware development support to assist with bespoke solutions. The LM747 Multimedia Module comes with a range of firmware for quick deployment. Firmware can be modified to meet your unique requirements or used for evaluation purposes. The Headset application is Bluetooth 5 complaint, supporting the Headset Profile (HSP), Advance Audio Distribution Profile (A2DP) and Audio/Video Remote Control Profile (AVRCP). This defines the way the LM747 receives audio streaming from a connected device. It also enables basic control functionality such as play-pausing music, answering-rejecting calls and adjusting the volume. This makes it the perfect solution for manufacturing wireless head phones. The AT Commands Structure (0103) application contains the Audio Gateway Hands Free Profile (AGHFP). AGHFP allows the LM747 module to be the source of the audio stream for the connected device to output. The application also provides AT Commands for Bluetooth and Bluetooth low energy connections. Serial data is transmitted with the Serial Port Profile (SPP) and the Serial over GATT (Bluetooth low energy service). Users can read, write or modify data on the connected devices by utilising simple AT commands. The AT Commands Structure (0102) application contains the Audio Gateway Hands Free Profile (AGHFP). AGHFP allows the LM747 module to be the source of the audio stream for the connected device to output. The application also provides AT Commands for the Bluetooth connection. Serial data is transmitted with the Serial Port Profile (SPP). Users can read, write or modify data on the connected devices by utilising simple AT commands. Applications are evaluated with the LM559 Multimedia Development Kit.